A central vision of this research is to establish a linkage between two related, but hitherto disconnected social science imaginaries of “circular flows” – the circuitry of the macroeconomy on the one hand, and the spatial circles of urban development on the other. On the opposing end of the ideological spectrum, Marxist theories of urban development recognize that capitalism has to urbanize to reproduce itself, thus suggesting a link between capital accumulation and space (Lefebvre 1970; Harvey 1985). Yet, while urbanists in the Marxist tradition view the city, above all, as the spatial locus of the accumulation of fixed capital as built environment and infrastructure, this school of thought offers no explicit framework to analyze the spatial consequences of finance. Heterodox monetary theories, on the other hand – from the German Historical School to Post-Keynesianism, most prominently perhaps in the work of Joseph Schumpeter (1939) and in the work of his student Hyman Minsky (1977; 1993) – emphasizes the importance of the financial sector as a source of fluctuations in the real sector, thus opening up a pathway for the non-neutrality of money. At the same time, however, these schools of thought remain largely aspatial, thus without immediate significance for understanding the process of urbanization under capitalism. This research endeavors to fill these theoretical lacunae in urban theory. 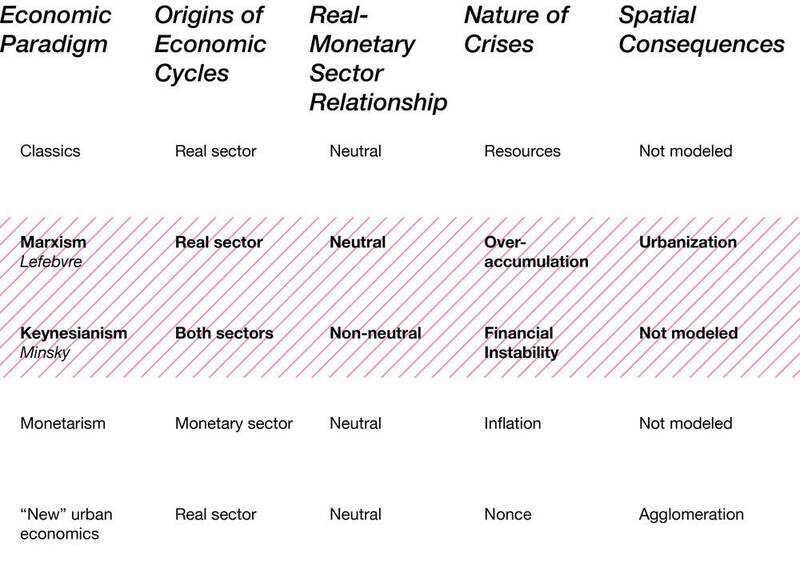 Our work is the first attempt to spatialize the analysis of finance in the tradition of Schumpeter and Keynes, thus emphasizing the importance of linkages between the institutional evolution of money, credit and banking and urban spatial structure. This project investigates how the evolution of finance and the process of urbanization concurrently give rise to different notions of cyclical risk that are coupled to metropolitan form. We illustrate the spatial consequences of the political economy of the U.S. housing finance system, paying particular attention to the historical process by which institutional risk allocation failures have shaped urban development in Detroit. The suburbs arose, in part, because building on the city's edge was deemed risk-free, cheap and, perhaps, a natural extension of the frontier mentality that is intellectually anchored by the convex bid-rent curves that emanate from the elegant shorthand of the monocentric city model. But the devastation wrought by on-going foreclosures across large swaths of suburbia is a sore reminder that building on the edge is anything but risk-free. Our exploratory investigation illustrates how the increasing financialization of real estate gives rise to new forms of systemic risk, which in turn have little understood consequences for the spatial structure of cities. Against the backdrop of the aftermath of the foreclosure crisis, we document changes to of metropolitan form in the process of geographic diversification, suggesting that urban spatial structure is fundamental to risk mitigation among investors and insurers of housing, mortgages, and mortgage-related derivatives. Rather than a state of exception, we argue that the recent upheavals in the housing market must be viewed as part of a macrohistory of crisis-based financial instability, the causes of which alternatingly emanate from the real economy or the financial system. Detroit’s rise and fall are largely driven by successive waves of over accumulation and speculative real estate development. Institutional origins of financial instability and banking-led crises in Michigan begin in 1830s (Free Banking). Detroit is at the epicentre of 1933 banking crisis; municipal bankruptcy precedent in 2013. As the financial frontier moves across time and space, different “zones of exclusion” emerge (mortgage speculation, large scale vacancies, financial illiteracy, under-banked sections of the population). The research presented here is rapidly beginning to evolve into a larger research program on “money and the city" wherein we emphasizes the hitherto neglected linkages between the institutional evolution of money, credit and banking and urban spatial structure. In subsequent work, we will develop a more formal framework for understanding the dynamics of urbanization under capitalism, highlighting the relevance of the work of Schumpeter, Keynes and Minsky on financial instability and monetary non-neutrality for urban theory. This work pays special attention to the role of the financial sector as a source of fluctuations in the real sector and the spatial structure of cities.